Hey folks! Jay Yelas here with another C.A.S.T. for Kids fishing tip! These little rods, you know they come equipped with pretty heavy line, like 10-pound line. You can catch a pretty good size fish with these little Cadence rods. The key is having the drag set just right so the fish will pull the line when he takes off. Wow! Then you just kind of lift and reel down. I’ve got a nice salmon there on this little pole. Look at this! You never know what you’re going to catch on a C.A.S.T. for Kids Cadence rod. These little rods will catch you some big fish like that. 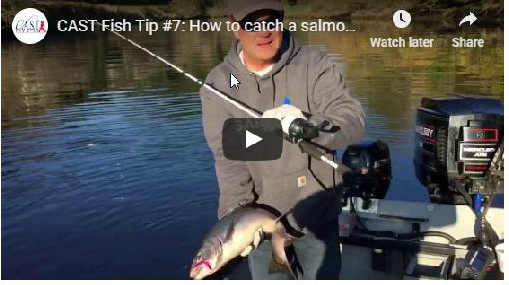 So, get your Cadence rod and don’t be afraid to take it out, even fishing for salmon. Because these little rods will handle a big one too. That’s your fishing tip for today. Get ready to come out to another fun C.A.S.T. for Kids event near you next summer!